Partial differential equations (PDEs) have long played crucial roles in the field of fluid dynamics. These PDE models, including Euler and Navier-Stokes equations for incompressible and compressible flows, kinetic equations for rarefied flows, and equations for more complex flows such as magneto-hydrodynamics flows, have motivated numerous studies from the theory of PDEs to the design and analysis of computational algorithms, and their implementation and application in computational fluid dynamics (CFD). 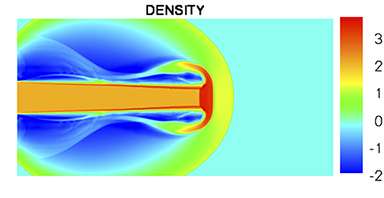 This discipline is continually and dynamically evolving, constantly bringing forward new results in PDE theory, computation, and application to CFD, and also setting up the ground for generalizations to other related applications including electro-magnetics, fluid-structure interactions, cosmology, and computational electronics. The aim of this workshop is to review the recent progress in the type of PDEs arising from fluid dynamics and other related physical areas, in terms of their theory, computation, and applications. The invited speakers include PDE analysts, applied and computational mathematicians, and engineers. Many of the invited speakers have made fundamental contributions to the development of PDE numerical methods and mathematical analysis as well as cutting edge applications. In harmony with ICERM's mission, the most significant aspect of this workshop is cutting-edge computational mathematics, and reinforcing the critical role played by computation in the mathematical and experimental aspects of fluid dynamics. This workshop aims to showcase recent advances in the theory and computation of PDEs with applications in CFD. It is thus an excellent vehicle to commemorate Professor Saul Abarbanel, who has made fundamental contributions to fluid dynamics and PDEs, especially in their computation and application to CFD. To honor his memory, this workshop will focus on recent developments in the field, highlighting the exchange of current research ideas and setting the stage for future research.